A little while ago there were a few questions here about a palm tree in the centre of Rainham behind the White Horse pub on Rainham High Street and next to the location of the former Co-op department store where the new NHS Health Centre is now located. At the weekend when I was in town I thought I'd have a look and see if the palm tree was still in place. 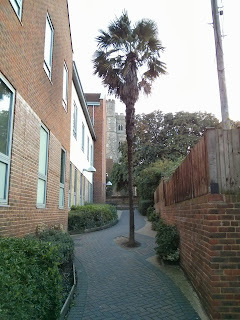 Remarkably despite all the development there is still a palm tree to the side of the White Horse pub and adjacent to the NHS centre in the middle of the footpath leading from Station Road to High Street. You can see Rainham church in the background with the NHS centre to the left and White Horse on right of the picture of the palm tree. Whether this is the original tree mentioned as being there in the 1980s I'm not sure but if not a new one has been replanted in a similar location.